Already found two Doh moments that might change a lot in some idiotic stuff I do with sketchup! D'oh! You forgot to charge for it! Beautifully done with all the pictures and extra tips-- I was expecting just a redo of the posts. I should have known better. GREAT JOB Rich! Damned this remember that I have not finished the translation of the Dohdoh thread! Maybe better that I translate first your very clear Book! If not yet yet existing French version ? Is beautiful that please without concept! nice read! learned a few new tricks. pilou wrote: Maybe better that I translate first your very clear Book! No French edition so translations are welcome. Rich, the book is really a very good tool. In some cases it was a good refresher tool and in others I really learned some neat new things to use regularly. I am always amazed that French is not the only language on the earth! Who knows when that will be finished! I've just started to read the book, but I'm already very impressed! A BIG thank you to everyone involved! 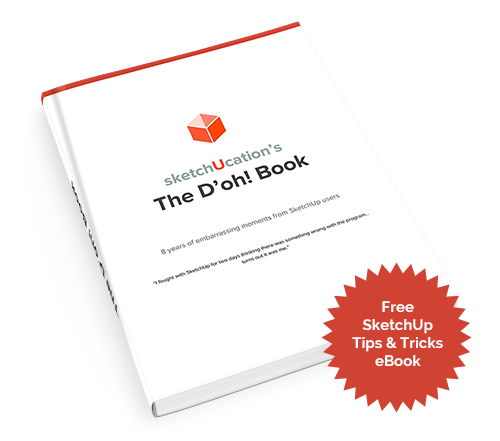 JQL wrote: Already found two Doh moments that might change a lot in some idiotic stuff I do with sketchup! You need chairs or sofa models? You need to be a Member to view images or to make downloads. Seems user can just save the entiere Web Page and make its own PDF! All that is too technic for me! Rich, thank you so much for your time and continued contributions to this forum. I have learned a lot from you. What a super and generous gift is the D'oh Book. A real treasure and thank you so very much for the sharing. Glad you both like it! It was a pleasure to read through the thread and compile it into a friendly and funny item. It was really cool to see everyone at Basecamp with a physical copy in their hands. There's about 30 copies left over that I must figure out what to do with. Have a 30 best new D'oh! contributions contest. Each one of the top thirty gets a book, and an entry into D'oh part Deux. Thank you so much for sharing this for free...! Thank you for nice gift. I try to save the book and get a message from Adobe Reader saying Access denied. Excellent! Thank you! I've already learned something new in 5 minutes! Many thanks! I've got to page 20 so far and had already 2-3 D'oh moments. Awsome this book. I see i can learn if I read this book. really good tips. Thank you for your work Rich. Gosh, learning never ends. It is well worth reading the book. I've submitted my name and email addy twice, but haven't received the link in my email. Thanks, its been a very interesting read. I appreciate your hard work! All people have the right to stupidity but some abuse the privilege.